Flexible mats of flat, domed cap strips for PCR or ultra clear cap strips for qPCR applications for use with Thermo Scientific 96-well PCR plates and strip tubes. 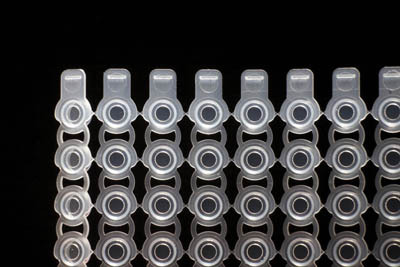 Thermo Scientific VersiCap Mats are unique, with each strip of eight caps being linked to each other forming the familiar 12 x 8 or 96-well ANSI format. The small tear points between strips enable a single strip or as many as required for the individual experiment to be separated. The Thermo Scientific VersiCap Mats are unique, with each strip of eight caps being linked to each other forming the familiar 12 x 8 or 96-well ANSI format. The small tear points between strips enable a single strip or as many as required for the individual experiment to be separated.